This beautiful old farmhouse is conveniently located just 2 miles from a major interstate but in the rolling hills countryside of Western PA. 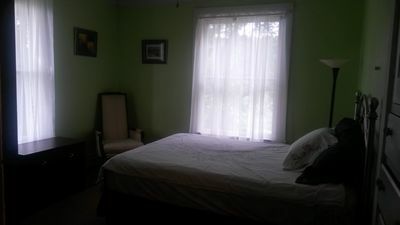 The 13 room house boasts original woodwork, pocket doors, spacious rooms and queen beds in every bedroom. It's just minutes from acclaimed bike trails, scenic Allegheny River activities, wineries and restaurants. You're renting the entire second floor, which has 4 bedrooms. Room 1 has a private bath. Rooms 2 and 3 share a bath. The 4th bedroom is a huge suite, with 2 queen beds and a sleeper. All rooms have windows with views of country meadows and woods. Gourmet Breakfast is included in the price of the rental and can be served in the main dining room according to your needs.